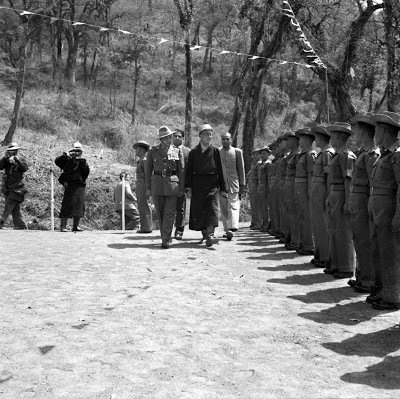 Following the failed Uprising of Tibetans in March 1959, the Supreme Ruler of Tibet has been forced to live in exile. His long, tedious journey in quest of Peace still continues with no hope for finding Natural Peace, Natural Harmony, and Natural Equilibrium in Occupied Tibet. If human interventions cannot restore Peace in Tibet, I do invite Heavenly Strike to restore Tibet Equilibrium. 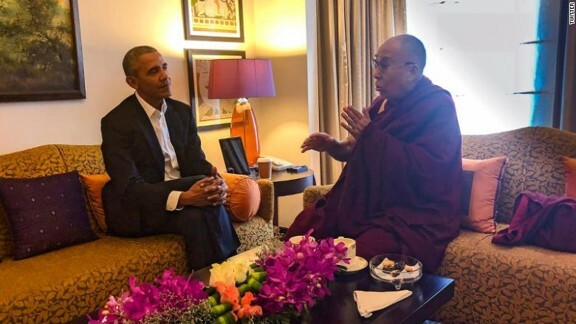 (CNN)Former US President Barack Obama met with the Dalai Lama on Friday in India, where they discussed "compassion and altruism," according to a representative from the Tibetan spiritual leader’s office. The meeting in New Delhi was the sixth between the two Nobel Peace Prize laureates, and the first since Obama left office in January. Obama is on a five-day world tour, including stops in China and France. The Dalai Lama said the meeting with Obama was "very good, I think we are really two old trusted friend(s)," according to a report from the India-based Central Tibetan Administration, which is essentially a government in exile. Kasur Tempa Tsering, a representative from the Dalai Lama’s office, told the administration’s Department of Information and International Relations that the 45-minute meeting included a discussion about "promoting peace in today’s world torn by strife and violence." "To Obama, His Holiness said, ‘You are not only a former US president but you are a Nobel laureate, you are young and you can do a lot. We should fulfill our aspiration for world peace. Maybe my generation will not see the results, but your generation will definitely see the results,’ " Kasur Tempa Tsering said, according to the report. The Dalai Lama officially retired in 2011 from his political role as the leader of the exiled Tibetan government but remains the head of Tibetan Buddhists and is scorned by the Chinese government. While Obama’s meetings as president with the Dalai Lama angered the Chinese, the US under his administration did not support an independent Tibet or consider the Dalai Lama a head of state. Instead, Obama backed what some Tibetans call a "middle way" that preserves the country’s religious and cultural heritage while maintaining China’s political rule. The Dalai Lama himself has backed such an arrangement, repeatedly insisting that he is not a "separatist" despite Chinese accusations. A spokesman for Obama could not be immediately reached on Friday for comment on the meeting. According to the Central Tibetan Administration, Obama hosted the Dalai Lama four times in the White House: February 18, 2010, July 16, 2011, February 21, 2014, and June 15, 2016, and the two first met in 2005, when Obama was a member of the Senate.